The 4801 has a Male Luer Lock for direct connection to a stopcock and/or a Female to Female adapter for use directly with a syringe. Both the 4801 and the 4803 are equipped with clamps for shut off. The 4803 has a Female Luer Lock and is intended for use primarily with a syringe but also to any male port such as a stopcock with two female ports and one male port. The 4512 Waste Bag has all lock connections which allows custom pack providers using 100% sterilization cycle to include the bag in a custom pack. The 4512 waste bags have 1-1/2 LB Check Valves that insure no waste fluid can inadvertently penetrate the Contrast or Saline Bags. You may customize as needed. 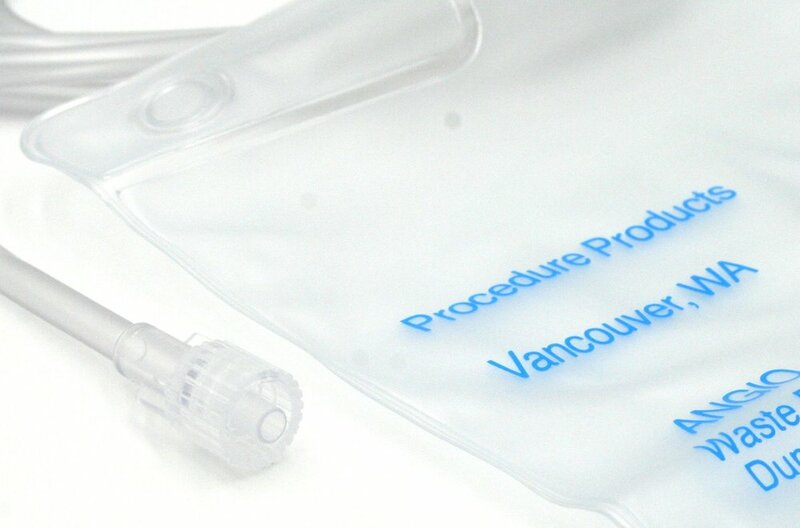 The 4571WasteBag has all lock connections which allows a Kit packer using 100% sterilization cycle to include the Waste Bag in the Angiography Pack. The 4571 waste bags have 1-1/2 LB Check Valves that insure no waste fluid can inadvertently penetrate the Contrast or Saline Bags. You may customize as needed. Bag The 4502 Waste Bag has all connections bonded and should be sterilized using a "Soft Cycle". This system employs a syringe mooring on Port 2. Port 3 has a Blue Strip on the IV line. The non-sterile 4559 Waste Bag has all lock connections which allows a kit packer to use a 100% Sterilization cycle. It is the same bag as the 4502 without the bonded connections. The 4559 waste bags have 1-1/2 LB Check Valves that insure no waste fluid can inadvertently penetrate the Contrast or Saline Bags. You may customize as needed. The non-sterile 4822 Waste Bag has all lock connections which allows a kit packer to use a 100% sterilization cycle to include the waste bag with dual check valve as well. Note: The 4822 has a 10-inch connection. You may specify a custom length of tubing with male lock.